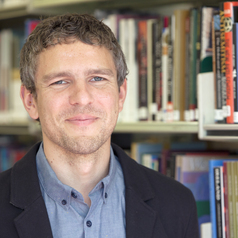 David Mitchell is Assistant Professor in Conflict Resolution and Reconciliation at the Irish School of Ecumenics, Trinity College Dublin at Belfast, where he teaches on the Master’s in Conflict Resolution and Reconciliation. He holds a BA in History and Philosophy, MA in Peace and Conflict Studies and PhD in Politics from Ulster University. He is author of Politics and Peace in Northern Ireland: Political Parties and the Implementation of the 1998 Agreement (Manchester University Press, 2015) and co-author of Ex-combatants, Religion and Peace in Northern Ireland (Palgrave Macmillan, 2013). In addition, he has published academic articles on various aspects of the Northern Ireland transition including religion, sport, language, and party politics.